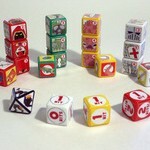 For those of you unfamiliar with Chunky Fighters, it’s a print-and-play dice game designed by Nick Hayes. The game is now in its 3rd edition, and that means all sorts of updates for the base game and its expansions. The downloadable files contain everything you’d ever need to make a Chunky Fighters set. Templates for paper dice, printable stickers if you have blank dice, even templates to create great, retail-quality packaging for the game. The idea of the game intrigues me, and the art looks great. I love the fact that you can make retail boxes for the game.